Five Nights At Freddy's is a game i've been waiting to review for a long time. This indie horror game is a point and click survival game that puts you as the role of a night security guard. Your objective is to survive from 12-6 AM, seems easy enough, right? Oh wait, it gets better! The catch is you have survive "haunted" animatronics that try to stuff you into a suit. Now, this has more popularity than you think, with tons of YouTubers showing their reactions to the game. 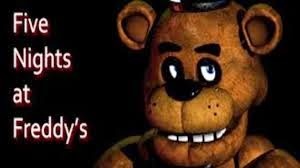 The game has four main antagonists, Freddy Fazbear, Bonnie the Bunny, Chica the Chicken, and Foxy the Pirate, and they're coming after YOU. Your only line of defense are two doors with lights, and a camera, seems legit, but the only flaw in your defenses is that you are limited on power, it's your only chance of survival. In order to have power throughout your shift, you have to conserve, and that's kind of hard on it's own since you lose power no matter what you do, even if you're just sitting there, which is what makes it so challenging. This, along with the eerie environments, is what makes it so scary, the feeling like you know something's going to pop up, but you don't know when, is a major factor here. The gameplay is not the only thing that makes this game so great, the extras like the easter eggs and storyline do too. First, the easter eggs. There are lots of little, but rare ones, like Freddy pulling his head off or seeing the words "It's Me" on the walls, in hallucinations, and even on the other side of Foxy's sign, but the one that has everyone talking is the "Golden Freddy" easter egg. The easter egg is triggered when you look at the poster in the "West Hall Corner", you may get to see a picture of Golden Freddy on it and hear a little girl giggling. When you see it and you put down your camera, you'll find Golden Freddy, even if both of your doors are closed. If you stare at him for too long, you'll get jumpscared by him and your game will crash, the same thing will happen if you enter 1987 into the custom 7th night. In the game, the only way to get rid of him is to pull up you camera. But, what's weird is that his body doesn't reflect on the monitors like the others, almost like he's a hallucination. Now, i'm not going to reveal much about the story, but I will tell you this, this story is emotionally deep, and it's also a really great story. Now, in this review I talked about many things about the game, but i've barely scratched the surface. If you want to know about the rest of the info, feel free to look it up. I will be reviewing it's sequel, Five Nights At Freddy's 2 (2014), soon. But for now, i'll see you later! -Editors Note: Five Nights at Freddy's is currently available for FREE for the holidays 2014 through the Amazon Appstore.